Originally, Basil was not the most popular herb in the bunch. Actually there were some who simply hated it, mainly the ancient people. The name basil means “be fragrant” but still various cultures battled with a love hate relationship over basil. Americans and Romans loved it while Hindus plant it in their homes as a sign of happiness. On the contrary it was the Greeks who despised it most but those from India and Persia were not too fond of it either. One place that took a special liking to Basil was Italy and to this day not many people prepare a classic pasta sauce without the Basil. To this day basil and tomato sauce have formed somewhat of a marriage almost globally. Basil is very easy to grow as long as the temperature does not fall below 50 degrees and is in full sunshine. It is popularly used both in the fresh form as well as the dried. A rare known fact about Basil is that the longer it simmers in a dish the more the flavor intensifies. This makes sense as to why people simmer their pasta sauces for so long, to bring out all of the rich herb flavors. 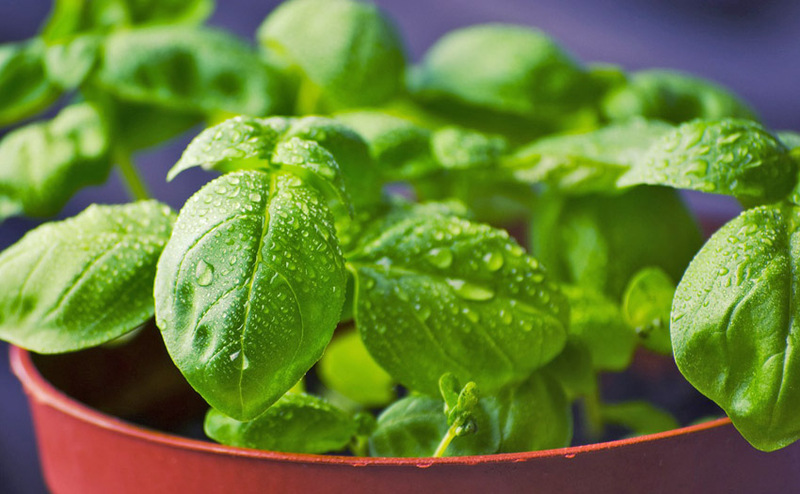 Normally in pasta sauces Basil is used in combination with Oregano. However, Basil is not just used for pasta or tomato sauce, it is also used for flavoring fish, vegetables, meats, and soups. If you decide to grow an herb garden, you can thank the Basil plants for keeping the flies away as flies are also part of the group that does not care for Basil. Another interesting fact about Basil is that it was considered a royal herb with a strong association pertaining to love. Basil had a relationship with how men of a much earlier time planned on proposing to their fair maidens. The man would bring a branch of Basil and if the woman accepted his gift she silently agreed to love him and be faithful to him for eternity. Basil is related to the Mint family and just knowing that should give you a good idea that it will have many medicinal uses as well. Right away most people associate anything mint with aiding the digestive system and also for its anti gas properties. Herbalists use Basil quite commonly for health ailments such as stomach cramps, vomiting, constipation, headaches and anxiety. When Basil is used for these purposes it is generally made into a hot tea for drinking. Some also claim that a nice hot cup of Basil tea can contribute greatly to a good nights sleep. At herbal stores you can also purchase Basil capsules as well if you do not care for the taste of the tea. Basil is still one of the most common household herbs used today and in most areas of culinary art it is a necessity there too. When used in its freshest form, Basil is torn from the plant and then just minced up with a knife. Usually somewhere nearby the Basil you will find some olive oil, garlic, and someone getting ready to prepare a fantastic tomato sauce.